Mayer & Cie. shows wide range of circular knitting technology uses at Techtextil in hall 3.0 both A06. Albstadt-based circular knitting machine manufacturer Mayer & Cie. (MCT) is exhibiting again this year at the Techtextil trade fair in Frankfurt. Mattress covers, car headliners and protective clothing can all be manufactured on a circular knitting machine. This production method has grown especially important in the manufacture of mattress covers. Well over half of the covers is made of fabrics produced on circular knitting machines – material that is both elastic and retains its shape. With its mattress covers Mayer & Cie. is already a force to be reckoned with in home textiles, or Hometech as the sector is known at Techtextil. The machines that make them are members of the OVJA family such as the OVJA 1.6 EM HS or OVJA 1.6 EE. Another established area in which circular knitting machines are used is to make covers for upholstered furniture of all kinds. That is a speciality of, inter alia, the MCPE 2.4, a machine for coloured all-over plush jacquard fabrics. The Relanit 0.8 does not use conventional yarns to manufacture textile fabrics. It knits spun steel fibres or copper, steel and silver wire, glass fibre, carbon fibre or carbon – including in combination with cotton and synthetic yarns. Their uses range from protective clothing to horticulture and electrically conductive textiles. Future opportunities are likely to be even more extensive, thanks to Mayer & Cie.’s spinning and knitting technology. 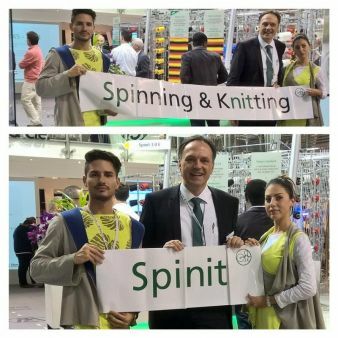 spinitsystems, the technology that combines spinning, cleaning and knitting, is part of the Mayer & Cie. presentation at Techtextil. The Spinit 3.0 E, the first machine to use the technology, processes a composite fibre and not the finished yarn. “That is why the options differ fundamentally from those of circular knitting technology,” says Michael A. Tuschak, in charge of spinitsystems marketing and sales at Mayer & Cie. So far, the machine has only processed cotton, but that is set to change in the near future. Mayer & Cie. has an open mind about new materials and uses. It has traditionally seen itself as an innovation driver and is constantly engaged in working on new solutions. With that in mind, the man in charge of spinitsystems looks forward to the trade fair in a relaxed mood. “I am very much looking forward to the ideas and questions that Techtextil visitors come up with,” Michael A. Tuschak says.